Sited in the former London Olympic park, Diller Scofidio + Renfro have won a competition to build a £25 million ($33.7 million) collection and research center for the Victoria and Albert Museum, part of a broader expansion of the museum into East London. The center will feature facilities for research and education and is to be built in the former Olympic Media Center, which is being redesigned and rebranded as Here East. The V&A’s new outpost is part of what is being called the Olympicopolis arts district, a burgeoning waterfront development at Queen Elizabeth Olympic Park. Apart from the V&A, as well as expected office and retail space, the Olympicopolis will be home to new expansions from Sadler’s Wells Theatre, the London College of Fashion, and the University College of London. The project is in part being led by the London Legacy Development Corporation, a city organization focused on adapting the structures from the 2012 London Olympics for continued use. The V&A was forced to create an additional space for their V&A East outpost after height restrictions required that the museum downsize its plans for their central building. The new locations will allow the V&A to display even more of their collection to the public and facilitate more research. The plan for the collection center came on the heels of the 2015 announcement by the government that they would sell the Blythe House, which currently serves as storage and archive for some of the V&A’s immense collection. DS+R, which won the competition ahead of four other shortlisted teams, will be working with British firm Austin-Smith:Lord and Studio Adrien Gardère to realize the center. In a press release, DS+R says that the space will be designed “from the inside out” and will be like an “immersive cabinet of curiosities.” No designs have yet been released to the public. In addition to the V&A collections center, DS+R also has a major concert hall, The London Center for Music, underway in London. Dubbed the "Flower Tower" and officially known as Hertsmere House, this new residential tower by HOK will be London's tallest residential building, reaching 771 feet. 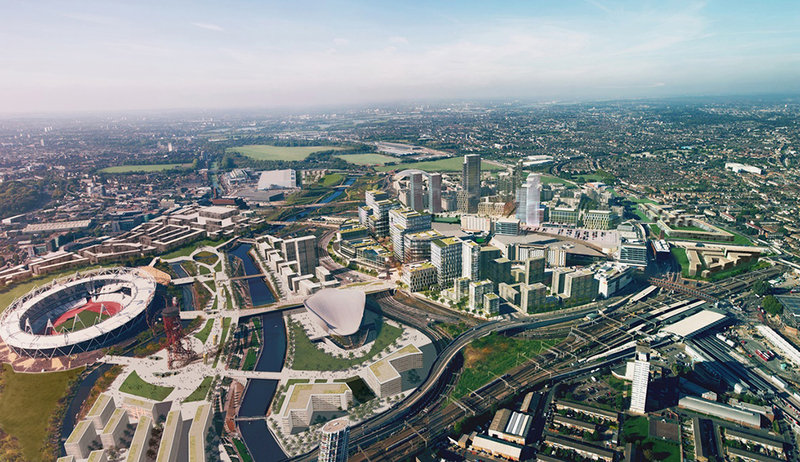 The petal-shaped tower was awarded planning permission last week to be constructed in East London's Dockland area. The 67-story building will offer 861 flats, of which 96 will be "affordable." Also included are shops, a pool, a cinema, and gym, though it's advised that you don't drive there, as only nine parking spaces will be available, all for disabled users. Another plot on Dalgleish Street in Limehouse adds 60 more “affordable” homes. Shanghai developer Greenland Group has hailed the design as a "vertical city" as it looks for tenants for the scheme. Despite its flowery nickname, all has not been rosy for the "Flower Tower," which has be been subject to criticism from heritage group Historic England. While the structure will offer views of West India Quay and the Isle of Dogs, Historic England worries that the building will disrupt views of these historic landmark areas as well as in Greenwich. Meanwhile, 15 local residents have written letters of complaint arguing that their homes will be cast in permanent shadow when the tower goes up. Jumping on board, Credit Suisse bank (whose voice is likely to carry more clout) argues that their nearby offices will be subject to noise disruption, vibration as well as dust and air pollution during the construction phases of the project, which should take a few years. In reply to this, council’s director of development and renewal, Aman Dalvi, said that "The site is highly suitable for a tall building." “The tower would be of a high architectural quality, providing a marker at the end of the dock," he added. "[It] would also form part of an established cluster of tall buildings.” Greenland says the project is its "most important project in Europe," and is reportedly paying Tower Hamlets Council $27.2 million, allocated solely for the affordable housing program. Meanwhile, an additional, $31.1 million will be contributed via "Community Infrastructure Levy and section 106 contributions." Construction of the tower also controversially involves temporarily removing the Grade II–listed West India Docks gateway and wall, a former port for all the West Indian cargo shipped in under the Imperial rule. Once the tower is built, the wall and gateway will be reconstructed brick by brick. 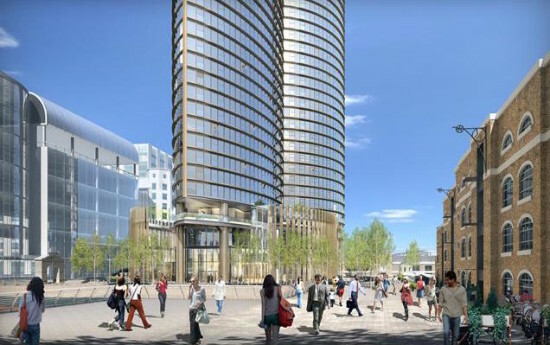 Construction on both the Dockland and Limehouse sites will break ground later in the year with the tower projected to be complete by 2020.